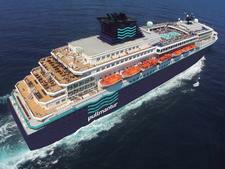 Pullmantur's Horizon most recently sailed as Island Star for the U.K.-based Island Cruises. (Prior to that, the 46,811-ton, 1,875-passenger ship sailed for Celebrity Cruises as Celebrity Horizon.) The ship caters to a Spanish-speaking clientele and cruises the Mediterranean, Canaries and Caribbean. Horizon features multiple bars and lounges (including a cigar bar), a delightful kids' club and a Broadway-style show lounge. Dining options include a casual buffet with adjacent outdoor grill and the main dining room, which serves set-time, set-table meals in the evening. For Recreation, there are two pools, a top-ship fitness facility and a spa. Island Star caters almost entirely to the British in the summer months, with a more international/ U.S. clientele mixing in on winter Caribbean runs. Casual is the name of the game on this ship but on my springtime sailing, the largely older clientele dressed well, smartening up for dinner and wearing slacks and polos or summer tops by day. This may change in the peak summer months, though, if signs in the Beachcomber asking passengers to cover up their torsos and don footwear before entering are anything to go by. Onboard tips are included in the cruise fare for travellers booking from the U.K.
--by Maria Harding. The U.K.-based Harding, a journalist and broadcaster, is one of Britain's best-known cruise writers. Her work has appeared in the Guardian, the Daily Mail, the Times, the Daily Telegraph and the Daily Express.